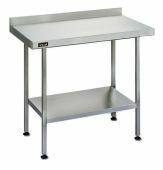 Stainless steel commercial catering tables are specifically designed to provide a durable, wear and heat resistance surface that is easy to clean and maintain, with smooth welded edges and flush fittings to avoid build up of kitchen grease. We stock steel tables suitable as food preparation surfaces, plating up areas or as stacking areas for dishes before or after washing up. A wide range of formats are available from wall benches and corner units with splashbacks, to flush sided cutting board tables and centre tables, and more specialised stainless steel prep stations with built in gantries or condiment pots.